Are you looking for exciting Party Entertainment Ideas? Looking for exciting party entertainment ideas? Why not hire some of our professional entertainers? They will amaze your guests leaving them smiling and cheering for more. 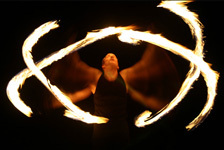 From highly skilled fire-eaters to high-tech glow jugglers our acts will make your event one to remember. So if you are planning a party, indoor or outdoor, day time or night time, for children, adults or both check out our acts to see which will best suit your event and make it stand out from the crowd. Fire shows to set your party alight! If you want to add danger and excitement to your party, fire performers are the act for you. From freestyle performances to choreographed group shows, and from meet and greet fire jugglers to stupendous pyrotechnic displays, Juggling Inferno's fire shows will make your event one to remember! 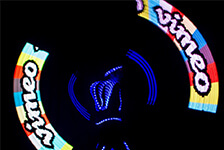 Cutting edge high-tech glow shows are an exciting way to impress your guests. Stunning visuals combined with virtuoso skill levels. We can even add a short message, image or logo into our props and lasers! We guarantee to wow your partygoers. 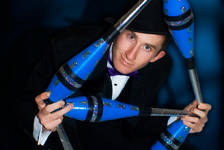 Walkabout jugglers – So skilful your jaw will hit the floor! Walkabout entertainers to mix and mingle with your guests. Skilful, fun and impressive, our walkabout jugglers will fit right in with your party, adding to the fun as they perform and interact. Delivering top quality skills and mingling with your partygoers to keep everyone smiling and enjoying the show. All of our acts are family friendly, fully insured and highly experienced full-time professional performers. This level of professionalism ensures you get top quality acts to make your party special. (Please see below for booking details). Want to know more? Enquiring is easy! Contact us now to find out how our party entertainment ideas will make your event one to remember.